Sustaining a spinal cord injury is a life changing event that will effect not just the person concerned, but also their family and friends. If you are close to someone who is spinal cord injured, you are likely to be experiencing any one of a multitude of emotions. You may find some of these emotions difficult to deal with on your own, or even feel that what you are experiencing is not how you should be feeling in these circumstances. Our Peer Support Officers are available to offer support to family and friends as well as SCI individuals. You can ring our Advice Line for information on all aspects of living with spinal cord injury. Our Advocacy Team provide support to help with issues around anything from air travel to retailers and more specifically with regard to the complex area of payment for care. Our Counselling Line provides the opportunity to talk in complete confidence, free of charge, to a suitably qualified professional with experience of supporting spinal cord injured people, their relatives and friends. Talking spinal cord injury: the family perspective is a 30 minute DVD in which four different family members openly share their experience of spinal cord injury and the impact it had on them. Watch Chris Cairns talk about his experience when his brother Lee became spinal cord injured in a car accident in 2005. Join SIA as a Family and Friends member and receive the full version of this free DVD as part of the Family and Friends Information Pack. Membership is free – just click here to find out more. You may also be interested in these publications from Australia – just click on the images to download a copy. NSW Department of Health: North Sydney; 2006, reprinted 2016. 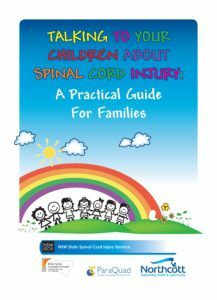 Talking to your children about spinal cord injury: a practical guide for families: Unger C, O’Reilly L, Serratore L, and Tulinsky C.
NSW State Spinal Cord Injury Service: Sydney; 2012. Contact other family members of spinal cord injured people through our Message board or by joining the Facebook group, SCI Owners Club Partners and Families – NB this is not a group related to SIA. 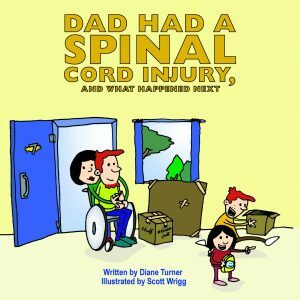 SIA produce a wide range of publications about spinal cord injury and the adjustments that may be necessary after an injury. These include a downloadable fact sheet on the emotional impact of SCI on the family, which is free to members. There are a range of different ways in which you can help us to continue to develop our services for spinal cord injured people. From challenging yourself to a Marathon to inviting friends over to share a fish and chip supper or simply signing up to easyfundraising.co.uk and supporting us as you shop.